Not too fond of large crowds? Do you want to enjoy the Festival of Lights with your children? Take a look at our selection, for 4 evenings away from the masses! We are not going to lie to you: a Festival of Lights without the bustle is not a festival. So, please don’t expect this great plan to provide a magic formula for having the illuminations all to yourself. That said, 3 areas have attracted our attention as part of the 2018 programme. They are slightly removed from the festival’s traditional locations and could be less busy and offer you more room to breathe. The park has not been part of the event since 2014, but is making a spectacular comeback this year! 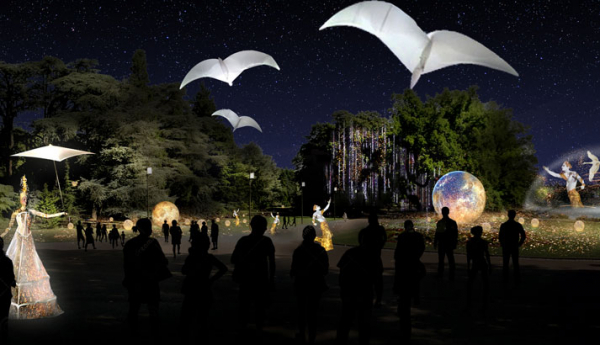 The banks of the Rhône will also be illuminated to guide visitors to the 2018 “Présages”. The park will become an illuminated world, with fireflies, sprites and birds, setting up the stage for a magician who will issue a warning: we must take care of this fairy-tale world otherwise it will disappear! With sufficient space to welcome a large number of people without feeling too crowded, the area of the park devoted to the festival will allow you to discover its treasures in a magical natural setting! By climbing Fourvière hill via the Montée du Gourguillon (which is also illuminated) or using the Saint-Just funicular (avoid using the Fourvière funicular, as the waiting time is too long), you will be able to enjoy a few moments of relative peace away from the crowds. Do you want to encourage young creators and experience the Festival of Lights of the future? 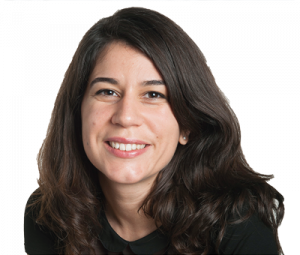 15 student installations and experiments will punctuate the Antiquaille district, while the Jardin André Malraux will host a cooperative project involving French, German and Romanian students. The façade of the Collège Jean Moulin will provide a backdrop for young artists experimenting with “mapping”’ (video projection onto the façade creating visual effects). A breath of fresh air is blowing over the Festival of Lights! 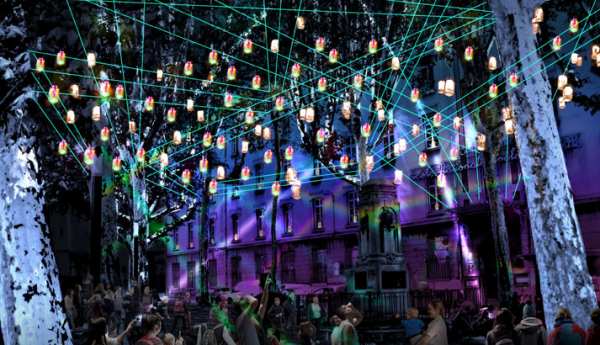 Close to the Place des Terreaux, in the heart of a vibrant district, the Martinière district will be home to community and charitable light installations! In Place Sathonay, the traditional Lumignons du Cœur (Candles from the Heart) will benefit the Docteur Clown association. Take the time to pause and dream in front of these candles that pay homage to Lyonnais tradition, for a good cause! In Place Rambaud, the charity Les Petits Frères des Pauvres and residents of care homes and day centres throughout the city have worked to create a mesh of around 300 solar lanterns, which will produce a play of light and reflections that creates a soft and soothing atmosphere! The Lycée de La Martinière, a historic seat of learning, comes alive! Its 27 windows will each house animated scenes telling the stories of the students who took part in this project. 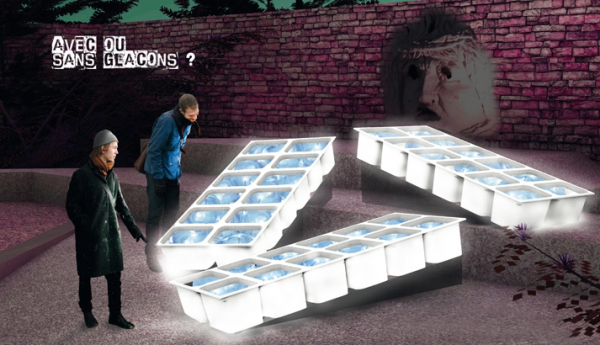 On the lower slopes of the Croix-Rousse, Place du Griffon will be enlivened by a participatory installation, which uses light to recreate the beats of 2 spectators’ hearts. When they beat in unison, this will trigger light and sound effects! Would you prefer to get out of Lyon? 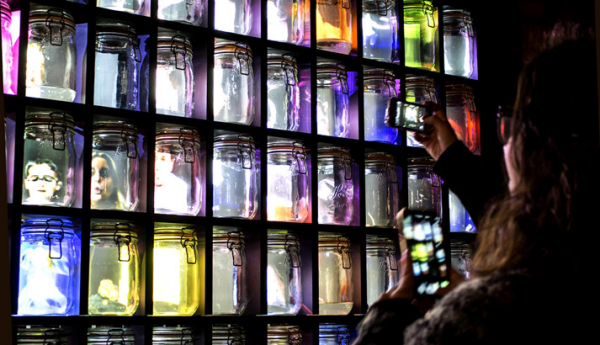 “The Village” shopping outlet is staging a light installation that plays with the re-use of animated jars… Animals and people find themselves trapped in these glass jars for a moment, like a spectator who is entitled to their minute of fame in a bubble! Exploring the notion of content and container, two other installations punctuate the shopping experience. Please note that there are free shuttles to The Village from Place Bellecour (near the Saint Exupéry sculpture) on Friday, Saturday and Sunday during the Festival of Lights!